This level has medium difficulty. 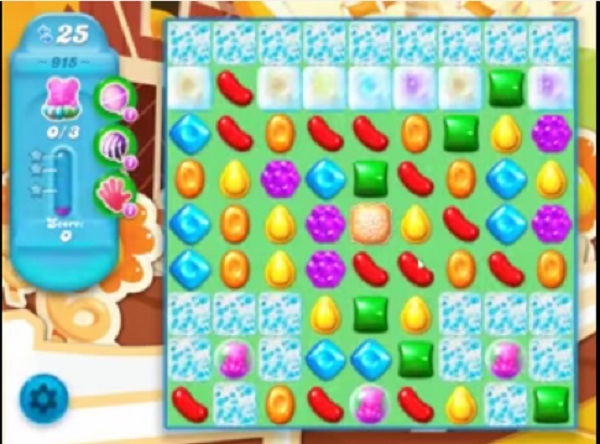 For this level try to play more from top part near to blockers and as you will play from top part of the board to shuffle the candies. Make special candy then near to bear to take them out from the board. Played this level for days using boosters and still did not come close to passing. You need to play the top and my only moves were at the bottom area… so frustrating…king needs to review this awful level. Een heel moeilijk spel,zo makkelijk als op de voorbeeld video is het niet!! There is no strategy to this level. It is pure luck as to the candies that you get. I have been playing this level for days and still haven’t come close. I will NEVER pass this level the candies DO NOT show like your video I really NEED help to get this one PLEASE help me Thank you so much I love this game BUT cannot get this one STUCK. I think certain games are a penance for people who don’t pay to continue. This one is clearly impossible unless they decide to give you a doable board. I get it that they’re in it to make money but if it’s not fun why bother and it’s no loss to them one way or the other. WOW ! This is a killer !!! None of my boards are near the video at all. Can barely get to the second level and out of moves. Can’t make boosters. . Time to play another game. Very frustrating.